Wainwright, M.Weber, P.K., Smith,J.B.,Hutcheon,I.D.,Klyce, B., Wickramisinghe, N.C., Narlikar,J.V. and Rajartnam,P. (2004).Studies on bacteria-like particles sampled from the stratosphere. Aerobiologia 20, 237-240. Wickramasinghe, NC,Wainwright, and Wickramasinghe,JT (2004). Panspermia (2003). New Horizons Proceedings of the Society of Photo-Optical Instrumentation Engineers (SPIE) 5163, 222-234. Wickramsinghe,N.C. ,Narlikar, J.V. ,Wickramsinghe,J.T. and Wainwright, M.(2004). The expanding horizons of cosmic life. Proceedings of SPIE Conference 4859 (In Press). Wainwright, M.,Wickramasinghe,N.C.,Narlikar,J.V., Rajaratnam,P. and Perkins,J.(2004). Confirmation of the presence of viable but non-culturable bacteria in the stratosphere. International Journal of Astrobiology, 3, 13-15. Narlikar,J.V. Wainwright et al,(2003) Balloon experiments to detect microorganisms in outer space Astrophysics and Space Science 285, 555-562. Wainwright, M. (2003). A microbiologist looks at panspermia. Astrophysics and Space Science 285, 563-570. Wickramasinghe,N. C., Wainwright, M.and Narlikar, J. (2003) SARS-a clue to its origin Lancet 361, 1832. Wainwright, M. (2003). Panspermia true or false? Lancet 362, 407. Wainwright, M,Wickramasinghe, N.C., Narlikar,J.V. and Rajaratnam.P. (2003). Microorganisms cultured from stratospheric air samples obtained at 41km. FEMS Microbiology Letters, 218 161-165. Nnarlikar, J.V.,Wickramasinghe,N.C. and Wainwright,M.(2003). Detection of microorganisms at high altitudes. Current Science 85-23-30. Wainwright, M., Al Harbi, S. and Wickramasinghe, N.C. (2006). How do microorganisms reach the stratosphere? International Journal of Astrobiology 5, 13-15. Wainwright, M. (2005). Astrobiology– a useful oxymoron Microbiology Today November, p1. Shivaji, S.,Chaturvedi, P.,Kuresh,K.,Redy,C.B.S.,Wainwright M.et al. (2006). Bacillus aerius sp. nov. isolated from cryogenic tubes used for collecting air samples from high altitudes. International Journal of Systematic and Evolutionary Microbiology 56, 1465-1473. Wainwright, M. (2007). How do bacteria get to the stratosphere? Proceedings SPIE Conference on Astrobiology, San Diego, 2007. Wainwright, M. (2008). The high cold biosphere-Microscope studies on the microbiology of the stratosphere. In Focus –Magazine of the Royal Microscopical Society 12, 32-41. Wallace, M.K., Wainwright, M., Wickramasinghe, J.T. and Wickramsinghe, N.C. (2008) Pitfalls of geocentricism. Astrophysics and Space Science 37,145-146. Wainwright, M., Leswd, A. and Alshammari,F. (2009). Bacteria in amber coal and clay in relation to lithopanspermia. International Journal of Astrobiology 8,141-143. Wainwright, M. (2010). Musings on the origin of life and panspermia. Journal of Cosmology 5, 1091-1100. Wainwright, M. (2010). The forgotten history of panspermia and theories on the origin of life. Journal of Cosmology, 7, 1771-1776. Wainwright, M., Alshammari, F. and Alabri, K. (2010). Are microbes currently arriving to Earth from space? Journal of Cosmology 7, 1692-1702. Alshammari, F. Wainwright, M., Alharbi, K. and Alhabri, S. (2010). Studies on ultrasmall bacteria in relation to the presence of bacteria in the stratosphere. International Journal of Astrobiology. 10, 99-103. Sulamain Ali Alharbi, Mohammad A. Khiyami, Reda Hassan Amasha, Bassam O. Al-Johny, Hesham Khalil and Milton Wainwright (2013). Nematodes rotifers tardigrades and diatoms as vehicles for the panspermic transfer of microbes. Life Science Journal 10, 1003-1006. Wainwright,M. M. (2010). Musings on the origin of life and panspermia. Journal of Cosmology, 5, 1091-1100. Wainwright, M. (2014). Astrobiology: Prescient words on comets and life. Nature, 516, 329-329. Wainwright, M., Alharbi, S. and Alabri, K. (2011). Panspermia-Nature’s exercise in microbial cultivation on a vast scale. Journal of Cosmology, 16, 6711-6717. Wainwright, M. and Alshammari, F. (2010). The forgotten history of panspermia and theories of life from space. Journal of Cosmology, 7, 1771-1776. Wainwright, M., Alshamari, F. and Alabri, K. (2010). Are microbes currently arriving to Earth from space? Journal of Cosmology, 7, 1692-1702. Wainwright, M., Rose, C., Baker, A., Wickramasinghe, C. N. and Omairi, T. (2015). Biological entities isolated from two stratosphere launches-continued evidence for a space origin. Journal of Astrobiology and Outreach, 3, 2332-2519.1000. Wainwright, M., Rose, C., Omairi, K., Baker, A., Wickramasinghe, C. and Alshammari, F. (2014). A presumptive fossilized bacterial biofilm occurring in a commercially sourced Mars meteorite. Journal of Astrobiology and Outreach, 2, 2332-2519.1000. Wainwright, M., Rose, C. E., Baker, A. J., Briston, J. and Wickramasinghe, C. 2013. Allen Hills and Schopf-like putative fossilized bacteria seen in a new type of carbonaceous meteorite. Journal of Cosmology, 22, 10198-10205. Wainwright, M., Rose, C. E., Baker, A. J., Briston, J. and Wicramasinghe, N. C. (2013). Typical meteoritic worm-like forms seen in the Polonnaruwa meteorite. Journal of Cosmology, 22, 10152-10157. Wainwright, M., Rose, C. E., Baker, A. J., Bristow, K. and Wickramasinghe,C. N. (2013). Isolation of biological entities from the stratosphere (22–27km). Journal of Cosmology, 22, 10189-10196. Wainwright, M., Rose, C. E., Baker, A. J., Bristow, K. and Wickramasinghe, N. C. (2013). Isolation of a diatom frustule fragment from the lower stratosphere (22–27Km)-Evidence for a cosmic origin. Journal of Cosmology, 22, 1063-1068. Wainwright, M., Rose, C. E., Baker, A. J., Karolla, R. and Wickramasinghe, N. C. (2013). Biology associated with a titanium sphere isolated from the stratosphere. Journal of Cosmology, 23, 11117-11125. Wainwright, M., Rose, C. E., Baker, A. J., Karolla, R. and Wickramasinghe, N. C. (2013). Filamentous Biological Entities Obtained from the Stratosphere. Journal of Cosmology, 22, 10206-10210. Wainwright, M., Rose, C. E., Baker, A. J., Karolla, R. and Wickramasinghe, N. C. (2013). Microspherules and presumptive biological entities found inside the Polonnaruwa meteorite. Journal of Cosmology, 22, 10197-10202. Wainwright, M., Rose, C. E., Baker, A. J., Karolla, R. and Wickramasinghe, N. C. (2013). More biological entities from the stratosphere including a diatom fragment-Further evidence for a space origin. Journal of Cosmology, 22, 10267-10274. Wainwright, M., Rose, C. E., Baker, A. J., Karolla, R. and Wickramasinghe, N. C. (2015). Masses staining positive for DNA-isolated from the stratosphere at a height of 41 km. Journal of Astrobiology and Outreach, 3, 2332-2519.1000. Wickramasinghe, N.C., Wainwright, M., Smith, W., Tokoro, G., AL Mufti, S. and Wallis, M. (2015). Rosetta studies of comet 67P/Churyumov–Gerasimenko: Prospects for establishing cometary biology. Astrobiology and Outreach, 3, 2332-2519.1000. Wickramasinghe, N. C., Tokoro, G. and Wainwright, M. (2014). Growing evidence for cosmic biology. Journal of Cosmology, 24, 12097-12101. Wickramasinghe, N. C., Tokoro, G. and Wainwright, M. (2014). The transition from Earth-centred biology to cosmic life. Journal of Cosmology, 24, 12080-12096. Wainwright, M. (2008). It’s not Darwin’s or Wallace’s’ Theory. Saudi Journal of Biological Sciences 25, 1-8. Wainwright, M. (2009). Charles Darwin and microbes. Microbiologist, 10, 32-35. Wainwright, M. (2010). Patrick Matthew–from natural selection to the germ theory. Microbiolgist 11, 43-45. Wainwright, M. (2011). Charles Darwin Mycologist and refuter of his own myth. Fungi 4, 12-20. Wainwright, M and Alharbi, S. A. (2010). The origin of species without Darwin and Wallace. Saudi Journal of Biological Sciences, 17, 187-204. Wainwright, M. and Alharbi, S. A. 2011. The story of a largely unknown evolution–germ theory hoax. Saudi J Biological Sciences, 18, 311-316. Wainwright, M. (2002). Do fungi play a role in the aetiology of cancer? 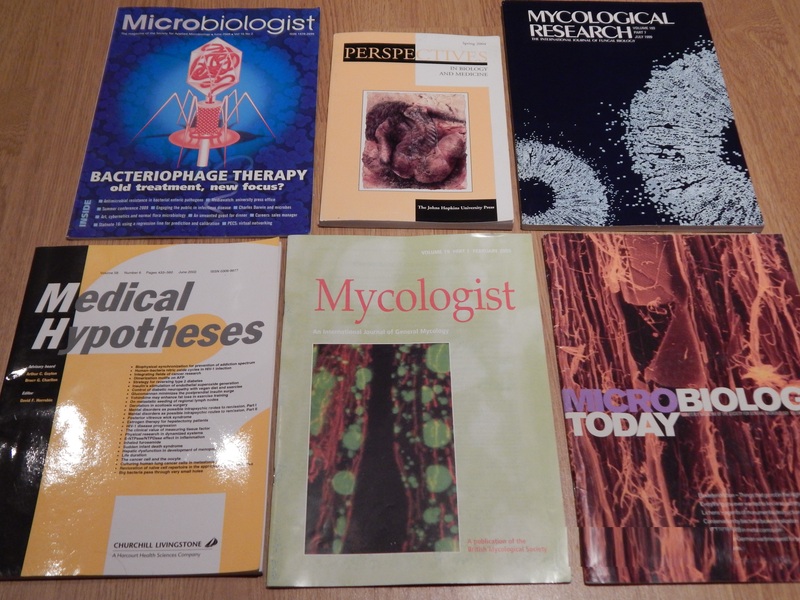 Reviews of Medical Microbiology 13, 1-6. Wainwright, M. and Al Talih, A. (2003). Is this the historical “cancer germ”? Medical Hypotheses, 60, 290-292. Wainwright, M. (2006). The potential role of non-virus microorganisms in cancer. Current Trends in Microbiology 2, 48-59. Wainwright, M. (2011). The overlooked link between non-virus microbes and cancer. Science Progress, 93,393-402. Wainwright, M. and G.J.F. Pugh (1973). The effect of three fungicides on nitrification and ammonification in soil. Soil Biology and Biochemistry 5, 577-584. Wainwright, M. and G.J.F. Pugh (1974). The effects of fungicides on certain chemical and microbial properties of soils. Soil Biology and Biochemistry 6, 263-267. Pugh, G.J.F., J.I. Williams and M. Wainwright 1975). Effects of fungicides on microbial activity in soils. Colloquium, 5th International Soil Science Society Prague (1973). Progress in Zoology. Czech Academy of Science, Prague, 17-22. Wainwright, M. and G.J.F. Pugh (1975). Changes in the free amino acid content of soil following fungicide treatment. Soil Biology and Biochemistry 7, 1-4. Wainwright M. and G.J.F. Pugh (1975). Phenol auxins and Erlich reactors in soils. Soil Biology and Biochemistry 7, 287-298. Wainwright, M. and G.J.F. Pugh (1975). Effects of fungicides on numbers of micro-organisms and frequency of cellulolytic fungi in soil. Plant and Soil 43, 561-572. Wainwright, M. and G.G. Kowalenko (1977). Effects of pesticides, lime and other amendments on soil ethylene. Plant and Soil 48, 253-258. Wainwright, M. and F.J. Sowden (1977). Influence of fungicide treatment on CaC12-extractable phosphorus and phosphate solubilizing micro-organisms in soil. Plant and Soil 48, 335-345. Wainwright, M. (1978). A modified sulphur medium for the isolation of sulphur oxidizing fungi. Plant and Soil 49, 191-193. Wainwright, M. (1978). Sulphur oxidizing micro-organisms on vegetation and in soils exposed to atmospheric pollution. Environmental Pollution 17, 167-174. Wainwright, M. (1978). Distribution of sulphur oxidation products in soils and on Acer pseudoplatanus growing close to sources of atmospheric pollution. Environmental Pollution 17, 153-160. Wainwright, M. (1979). Effects of pesticides and N-Serve on the oxidation of elemental sulphur in soil. Plant and Soil 51, 205-213. Wainwright, M. (1979). Microbial S-oxidation in soils exposed to heavy atmospheric pollution. Soil Biology and Biochemistry 11, 95-98. Wainwright, M. (1979). Assay of phenol o-hydroxylase activity in soil. Soil Biology and Biochemistry 11, 549-551. Duddridge, J.E. and M. Wainwright (1980). Effect of sodium chloride on enzyme activity and synthesis in river sediments. Environmental Technology Letters 1, 319-326. Killham, K. and M. Wainwright (1980). Closed combustion method for the rapid determination of total sulphur in atmospheric-polluted soils and vegetation. Environmental Pollution (Series B) 2, 81-85. Wainwright, M. (1980). Effect of exposure to atmospheric pollution on microbial activity in soil. Plant and Soil 55, 199-204. Wainwright, M. and J. Johnson (1980). Determination of sulphite in mineral soils. Plant and Soil 54, 299-305. Wainwright, K. Killham and M.E. Diprose (1980). Effect of 2450 MHz microwave radiation on respiration, nitrification and S-oxidation in soil. Soil Biology and Biochemistry 12, 489-493. Wainwright, M. and Killham (1980). Sulphur oxidation by Fusarium solani. Soil Biology and Biochemistry 12, 555-558. Duddridge, J.E. and M. Wainwright (1980) .Heavy metal accumulation by aquatic fungi and reduction in viability of Gammarus pulex fed Cd2+ contaminated mycelium. Water Research 14, 1605-1611. Wainwright, M. (1980). Alginate degradation by the marine fungus Dendryphiella salina. Marine Biology Letters 1, 351-354. Killham, K., N.D. Lindley and M. Wainwright (1981).Inorganic sulfur oxidation by Aureobasidium pullulans. Applied and Environmental Microbiology 42, 629-631. Wainwright, M. and V. Sherbrock-Cox (1981). Factors influencing the degradation of alginate by Dendryphiella salina and D. arenaria. Botanica Marina 24, 489-491. Duddridge, J.E. and M. Wainwright, (1981). Heavy metals in river sediments – Calculation of metal adsorption maxima using Langmuir and Freundlich isotherms. Environmental Pollution (Series B.) 26 387-397. Duddridge, J.E. and M. Wainwright (1981). Enzyme activity measurements as a means of assessing a river sediment’s capacity to degrade organic pollutants. Environmental Technology Letters 2, 75-80. Killham, K. and M. Wainwright (1981). Microbial release of sulphur ions from atmospheric pollution deposits. Journal of Applied Ecology 18, 889-896. Killham, K. and M. Wainwright (1981). Deciduous leaf litter and cellulose degradation in soils exposed to heavy atmospheric pollution. Environmental Pollution (Series A) 26, 69-78. Wainwright, M. (1981). Assay and properties of alginate lyase and 1, 3-glucanase in intertidal sands. Plant and Soil 59, 83-89. Wainwright, M. (1981). Enzyme activity in intertidal sands and salt-marsh soils. Plant and Soil 59, 357-363. Duddridge, J.E. and M. Wainwright (1982). Enzyme activity and kinetics in substrate amended river sediments. Water Research 16, 329-334. Killham, K. and M. Wainwright (1982).Determination of the extent of air pollution contamination of a woodland ecosystem downwind of a coking works. Environmental Technology Letters 3, 75078. Skiba, U. and M. Wainwright (1982). Assay of urease activity in marine sands – its use as an indicator of sewage contamination of beaches. Enzyme and Microbial Technology 4, 310-312. Wainwright, M. and K. Killham (1982). Microbial transformations of some particulate pollution deposits in soil – a source of plant-available nitrogen and sulphur. Plant and Soil 65, 297-301. Wainwright, M. (1982). Origin of fungal colonies on dilution and soil plates determined using nonanoic acid. Transactions of the British Mycological Society 79, 178-79. Wainwright, M. (1982). A new method for determining the microbial degradation of keratin in soils. Experientia 38, 243-244. Supharungsun, S. and M. Wainwright (1982). Determination, distribution and adsorption of F- in atmospheric-polluted soils. Bulletin of Environmental Contamination and Toxicology 28, 632-636. Wainwright, M. and J.E. Duddridge (1982). Effects of heavy metals on enzyme synthesis in substrate-amended river sediments. European Journal of Applied Microbiology and Biotechnology 15, 241-245. Wainwright, M., J.E. Duddridge and K. Killham (1982). Assay of amylase in soil and river sediments, its use to determine the effects of heavy metals on starch degradation. Enzyme and Microbial Technology 4, 32-34. Wainwright, M., S. Supharungsun and K. Killham (1982). Effects of acid rain on the solubility of heavy metal oxides and fluorspar (CaF2) added to soil. The Science of the Total Environment 23, 85-90. Skiba, U. and M. Wainwright (1983). Assay and properties of some sulphur enzymes in coastal sands. Plant and Soil 70, 125-132. Killham, K. and M. Wainwright, (1984). Chemical and microbial changes in soils exposed to heavy atmospheric pollution. Environmental Pollution. (Series A) 33, 121-131. Skiba, U. and M. Wainwright (1984). Nitrogen transformations in coastal sand dunes. Journal of Arid Environments 7, 1-8. Skiba, U. and M. Wainwright (1984). Urea hydrolysis and transformations in coastal dune sands and soils. Plant and Soil. 82, 117-123. Skiba, U. and M. Wainwright (1984). Oxidation of elemental S in coastal dune sands and soils. Plant and Soil 77, 87-95. Wainwright, M., U. Skiba and R.P. Betts (1984). Sulphur oxidation by a Streptomyces sp. growing in a carbon-deficient medium and autoclaved soil. Archives of Microbiology. 139, 272-76. Wainwright, M. (1984). Sulphur oxidation by some thermophilous fungi. Transactions of the British Mycological Society. 83, 721-724. Wainwright, M. and S. Supharungsun (1984). Release by fungi of F- from insoluble fluorides. Transactions of the British Mycological Society 82, 289-292. Wainwright, M. (1985). Re-examination of some of John Tyndall’s studies on microbial antagonism. Transactions of the British Mycological Society 85, 526-529. Wainwright, M., R.P. Betts and D.M. Teale (1985). Antibiotic activity of oosporein from Verticillium psalliotae. Transactions of the British Mycological Society. 86, 168-170. Wainwright, M., W. Nevell and U. Skiba (1985). The fertiliser potential of commercially available forms of keratin and microbial biomass. Enzyme and Microbial Technology. 7, 108-110. Nevell, W. and M. Wainwright (1986). Increased toxicity of cadmium to Trichoderma harzianum due to the presence of a soil pseudomonad. Transactions of the British Mycological Society 86, 651-652. Nevell, W. and Wainwright (1986). Microbial growth on polluted leaf and litter leachates: effects on pH and sulphate concentrations. Plant and Soil. 92, 303-308. Nevell, W. and M. Wainwright (1986). Increases in extractable sulphate following soil submergence with water, dilute sulphuric acid or acid rain. Environmental Pollution. (B) 12, 301-311. Grayston, S.J., W. Nevell and M. Wainwright (1986). Sulphur oxidation by fungi. Transactions of the British Mycological Society. 87, 193-198. Wainwright, M., S.J. Grayston and P. de Jong (1986). Adsorption of insoluble compounds by mycelium of the fungus Mucor flavus. Enzyme and Microbial Technology 8, 597-600. Wainwright, M. and S.J. Grayston (1986). Oxidation of heavy metal sulphides by Aspergillus niger and Trichoderma harzianum. Transactions of the British Mycological Society 86, 269-272. Wainwright, M., W. Nevell and S.J. Grayston (1986). Effects of organic matter on sulphur oxidation in soil and influence of sulphur oxidation on soil nitrification Plant and Soil 96, 369-376. Grayston, S.J. and Wainwright, M. (1987). Fungal sulphur oxidation: effect of carbon source and growth stimulation by thiosulphate. Transactions of the British Mycological Society 88, 213-219. Wainwright, M. and Grayston, S.J. (1987). Nitrification and sulphur oxidation by Aspergillus flavus growing in medium containing reduced nitrogen and sulphur. Transactions of the British Mycological Society 88, 309-315. Nevell, W. and Wainwright, M. (1987). Influence of soil moisture on sulphur oxidation in a brown earth soil exposed to atmospheric pollution. Biology and Fertility of Soils 5, 209-214. Nevell, W. and Wainwright, M. (1987). Nitrification and urea hydrolysis in deciduous woodland soil from a site exposed to heavy atmospheric pollution, Environmental Pollution 45, 49-59. Nevell, W. and Wainwright, M. (1987) Seasonal changes in the sulphate content of deciduous woodland soils exposed to atmospheric pollution Environmental Pollution 47, 195-204. Nevell, W. and Wainwright, M. (1987). Changes in sulphate concentration in an atmospheric-polluted brown earth following a water-logging-drying cycle. Journal of Plant Nutrition and Soil Science 150, 147-150. Grayston, S.J. and Wainwright, M. (1988). Sulphur oxidation by soil fungi including species of mycorrhizae and wood rotting Basidiomycetes. FEMS Microbiology Ecology 53, 1-8. Wainwright, M. and S.J. Grayston (1988). Fungal growth and stimulation by thiosulphate under oligocarbotrophic conditions. Transactions of the British Mycological Society 91, 149-156. Parkinson, S.M. Wainwright, M. and Killham, K. (1989). Observations on oligotrophic growth of fungi on silica gel. Mycological Research 93, 529-534. Singleton, I., Wainwright, M. and Edyvean, R.J. (1989). Some factors influencing the adsorption of particulates by fungal mycelium. Biorecovery 1, 271-289. Wainwright, M., I. Singleton and R.J.V. Edyvean (1989). Use of fungal mycelium to adsorb particulates from solution. In Proceedings of the Biohydrometallurgy Conference 87, Warwick Science and Technology Letters 105. 499-502. Grayston, S.J. and M. Wainwright, (1989). Role of fungi in the solubilization of heavy metal sulphides Ibid 552-553. Wainwright, M., Singleton, I., and Edyvean, R.G.J. (1990). Magnetite adsorption as a means of making fungi susceptible to a magnetic field. Biorecovery 2, 37-53. Parkinson, S.M., Killham, K. and Wainwright, M. (1990). Assimilation of 14CO2 by Fusarium oxysporum grown under oligotrophic conditions. Mycological Research 94,959-964. Jones, Parkinson, S., Wainwright, M. and Killham, K. (1991). Oxidation of thiosulphate by Fusarium oxysporum grown under oligotrophic conditions. Mycological Research 95, 1169-1174. Wainwright, M., Adam Ali, T. and Killham K. (1994). Anaerobic growth of fungal mycelium from soil particles onto nutrient-free silica gel. Mycological Research 7, 761-762. Adam Ali, T. and Wainwright M. (1994). Growth of Phanerochaete chrysosporium in soil and its ability to degrade benomyl. Bioresource Technology 49, 197-201. Wainwright, M., Adam Ali, T. and Killham, K. (1994). Anaerobic growth of fungal mycelium from soil particles onto nutrient-free silica gel. Mycological Research 98, 761-762. Fali, A.M.K. and Wainwright, M. (1995). Nitrification and S-oxidation by the soil yeast Williopsis californica and by Saccharomyces cerevisiae. Mycological Research 99, 200-204. Wainwright, M. and Falih, A.M.K. (1995). Nitrification in vitro by a range of filamentous fungi and yeasts. Letters in Applied Microbiology 21, 18-19. Adam Ali, T.A. and Wainwright, M. (1995). Effect of Phanerochaete chrysosporium on transformations of urea, sulphur-coated urea and peptone in soil. Bioresource Technology. 53, 91-93. Falih, A.M. K. and Wainwright (1996). Microbial and enzyme activity in soils amended with a natural source of easily available carbon. Biology and Fertility of Soils 21, 177-183. Wainwright, M. and Falih, A.M.K. (1996). Involvement of yeasts in urea hydrolysis and nitrification in soil amended with a natural source of sucrose. Mycological Research 100, 307-310. Wainwright M., Al-Wajeeh and Grayston, S.J. (1997). Effect of silicic acid and other silicon compounds on fungal growth in oligotrophic and nutrient-rich media. Mycological Research, 101, 933-938. Wainwright, M. Killham, K., Russell, C. and Grayston, J. (1997).Partial evidence for the existence of mitogenetic radiation. Microbiology, 143, 1-3. Wainwright, M.(1997). When heresies collide- extreme bacterial pleomorphism and the cancer germ. Microbiology 144,595-596. Wainwright, M. and A.M. Falih. (1997). Fungal growth on buckminsterfullerene. Microbiology 143, 2097-8. Wainwright, M. (1998). Hypothesis-Can UV light produced by intracellular bacteria cause cancer? Microbiology 144, 3239-3241. Wainwright, M., Canham, L.T. Al-Wajeeh, K. and Reeves, C.L. (1999). Morphological changes (including filamentation) in Escherichia coli grown under starvation conditions on silicon wafers and other surfaces. Letters in Applied Microbiology 29, 224-227. Wainwright, M. and Al-Talhi, A. (1999). Selective isolation and oligotrophic growth of Candida on nutrient-free silica gel medium. Journal of Medical Microbiology. 48, 130. Wainwright, M. (1999). Nanobacteria and associated “elementary bodies” in human disease and cancer. Microbiology 145, 623-2624. Wainwright, M. (2000). Highly pleomorphic staphylococci as a cause of cancer. Medical Hypotheses 54, 91-94. Wainwright, M.et al. (20002). Big bacteria pass through very small holes. Medical Hypotheses 58,558-560. Wainwright, M., Al-Yousef, S. and Anderson, R. (2003). Is biological cold fusion a real phenomenon? Journal of Scientific Exploration 17,122-124. Alnaimat, A.,Wainwright, M.and Albrid, K. (2012). Antibacterial potential of honey from different origins: A comparison of Manuka honey. Journal of Microbial and Biotechnological Food Science. 1, 1328-13318. Wainwright, M. (1977). Effects of fungicides on the microbiology and biochemistry of soils – a review. Journal of Plant Nutrition and Soil Science 140, 587-603. Wainwright, M. (1978). Microbial sulphur oxidation in soil. Science Progress 65, 459-475. Wainwright, M. (1978). A review of the effects of pesticides on microbial activity in soils. Journal of Soil Science 29, 287-298. Wainwright, M. (1980). Man-made emissions of sulphur and the soil. International Journal of Environmental Studies 14, 279-288. Wainwright, M. (1981). Mineral transformations by fungi in culture and in soils. Journal of Plant Nutrition and Soil Science 144, 41-63. Wainwright, M. and Nevell, W. (1984). Microbial transformations of sulphur in atmospheric-polluted soils. Reviews on Environmental Health 4, 339-356. Wainwright, M. (1984). Sulfur oxidation in soils. Advances in Agronomy 37, 349-396. Wainwright, M., W. Nevell and S.J. Grayston (1986). The potential use of heterotrophic sulphur oxidizing micro-organisms as inoculants to enhance sulphur oxidation in soils. Sulphur in Agriculture 10, 6-11. Wainwright, M. (1988). Metabolic diversity of fungi in relation to growth and mineral cycling in soil – a review. Transactions of the British Mycological Society 90, 159-170. Wainwright, M., Barakah, F., Al-Turk, I., and Adam Ali, T. (1992). Oligotrophic microorganisms in industry medicine and the environment. Science Progress 75, 313-322. Wainwright, M. (1994). Biological control of microbial infections and cancer in humans – Historical use to future potential. Biological Control. Science and Technology 4, 123-131. Wainwright, M (2005). Fungal oligotrophy In: Dighton et al. eds. The Fungal Community, pp.1-16, CRC Press. Wainwright, M. (2010). Fungi: amazing chemists, In: Coleman, M. Ed (2010) From Another Kingdom: The Amazing World of Fungi. Edinburgh, Royal Botanic Gardens. Wainwright, M. (1982). Microbial oxidation of sulphur in soils subject to atmospheric deposition. Proceedings of the International Sulphur Conference. London 1, 427-437. Wainwright, M. and W. Nevell (1987). The microbial sulphur cycle in atmospheric polluted soils. In Pollutant Transport and Fate in Ecosystems (ed. Coughtrey P.J. et al.) Special Pub. No. 6. British Ecological Society 181-192. Wainwright, M. (1988). Sulphur oxidation by fungi. In Nitrogen Phosphorus and Sulphur Metabolism ed. Boddy L. et al. B.M.S. Meeting Birmingham, April l988. 71-88. Wainwright, M. (1988). Structure and biology of bacteria relevant to the action of disinfectants. Industrial Biocides. Critical Reports on Applied Biochemistry 23, 1-19. Wainwright, M. and S.J. Grayston (1989). Adsorption and oxidation of metal sulphides by fungi. In Metals and Microbes G. Gadd et al. eds. Society for General Microbiology. Academic Press 119-130. Singleton, I. Wainwright, M. and Edyvean, R.G.J. (1990). Novel biorecovery methods for industrial wastewater treatment. Institute of Chemical Engineers Symposium Series, 116,363-369. Germida, J., Wainwright, M. and V.V.S.R. Gupta (1990). Biochemistry of sulphur cycling in soils. Soil Biochemistry 7, 1-54. Wainwright, M. (1990). Field methods used in the determination of sulphur transformations in soils. A.F. Harrison, P. Ineson and O.W. Heal (eds). Nutrient Cycling in Terrestrial Ecosystems. Elsevier,pp. 218-232. Wainwright, M. (1990). Novel uses for fungi in biotechnology. Chemistry and Industry Jan. 15, 31-34. Wainwright, M. (1992). The impact of fungi on environmental biogeochemistry. In The Fungal Community (2nd Ed) ed. Wicklow and Carroll, 601-619. Wainwright, M. (1993). Oligotrophic growth of fungi – Stress or natural state? In Stress Tolerance of Fungi. D.H. Jennings ed. Academic Press. 172-184. Wainwright, M. (1997). Fungal biotechnology. In McGraw Hill Yearbook of science and Technology. 1997, 215-217. Wainwright, M. and Gadd, G. (1997). Fungi and industrial pollutants. In The Mycota Wicklow, D. (ed.).85-97. Wainwright, M. (2005).Childbed Fever. Microbiologist 6, 6-29. Wainwright, M. (2004). Fleming’s unfinished. Perspectives in Biology and Medicine 45, 529-538. Wainwright, M. (2003). An alternative view of the early history of microbiology. Advances in Applied Microbiology 52, 333-353. Wainwright, M. and Swan, H.T. (1986). C.G. Paine and the earliest surviving clinical record of penicillin therapy. Medical History 30, 42-56. Wainwright M. (1987). The history of the therapeutic use of crude penicillin. Medical History, 31, 41-50. Wainwright, M. (1988). Maggot therapy – a backwater in the fight against bacterial infection. Journal of the American Institute for the History of Pharmacy 30, 19-26. Wainwright, M. (1989). Moulds in folk medicine. Journal of the Folklore Society 100, 162-6. Wainwright, M. (1990). Besredka’s antivirus in relation to Fleming’s initial view of the nature of penicillin. Medical History 34, 79-85. Wainwright, M. (1991). Streptomycin: discovery and resultant controversy. Journal of the History and Philosophy of the Life Sciences 13, 97-124. Wainwright, M. (1992). The Sinkovics hybridoma-the discovery of the first natural hybridoma. Perspectives in Biology and Medicine. 35, 372-379. Wainwright, M., and Lederberg, J. (1992). History of Microbiology. In Encyclopaedia of Microbiology Vol 2, Ed. J. Lederberg, Academic Press 2, 419-437. Wainwright, M. (1993). The mystery on the plate. Fleming’s discovery and early contribution to the development of penicillin. Journal of Medical Biography 1, 59-65. Wainwright, M. (1993). A postgraduates contribution to the Krebs Cycle. Trends in Biochemical Science 18, 61-62. Frankland, A.W. and Wainwright, M. (1994). More mysteries from Fleming’s plate. Journal of Medical Biography 2, 61-62. Wainwright, M.(1997). Extreme pleomorphism and the bacterial life cycle-a forgotten controversy. Perspectives in Biology and Medicine 40, 407-25. Wainwright, M.(1998). James Young and the cancer germ. Journal of Medical Biography. 6,203-205. Wainwright, M. (1997). Robert Donaldson-Pioneer in the biological treatment of infected wounds. Journal of Medical Biography. 6, 86-88. Wainwright, M. (1998). Historical and recent evidence for the existence of mitogenetic radiation. Perspectives in Biology and Medicine.41,565-571. Wainwright, M. (1999). Living alternatives to antibiotics. Medical Microbiologist, Autumn, 1999, 7-9. Wainwright, M. (2002). Fleming’s unfinished Perspectives in Biology and Medicine 45, 529-538. Wainwright, M. (2005) .Response to “Streptomycin, Schatz versus Waksman etc” by W. Kingston. Journal of the History of Medicine and Allied Sciences. Wainwright, M.(2006). A day with Fleming’s famous petri dish and the case of the missing page. 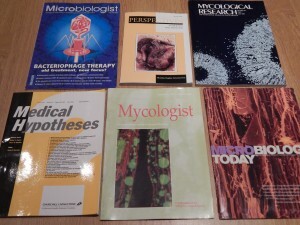 Microbiologist, September, 2006,28-30. Wainwright, M.(2008). Some highlights in the history of fungi-A personal journey. Fungal Biology Reviews 30, 1-6. Wainwright M. and Swan, H.T. (1987). The Sheffield penicillin story. Mycologist 21, 28-31. Wainwright, M. (1988). Fleming did discover penicillin. Society for General Microbiology Quarterly 15, 30-31. Wainwright, M. (1988). Selman A. Waksman and the streptomycin controversy. Society for General Microbiology Quarterly 15, 90-92. Wainwright, M. (1989). Moulds in ancient and more recent medicine. Mycologist. 3, 21-23. Wainwright, M. (1991). Fleming’s early search for antibiotics other than penicillin. Society for General Microbiology Quarterly 18,46-47. Wainwright, M. (1997). St Mary’s other man of penicillin. St Mary’s Hospital Gazette. 103,38- 40. Wainwright, M. (1997). A response to some criticisms of Fleming’s role in the discovery of penicillin, St Mary’s Hospital Gazette 103, 31- 34. Wainwright, M.(2001). Childbed fever-The Semmelweis myth. Microbiology Today 28,173-4. Wainwright, M. (1987). Can fungi grow on fresh air? Mycologist. 1, 182-3. Wainwright,M.(1989). Noble Infallibility. Nature 342, 336. Wainwright, M. (1989). Fungi have seen the light. Mycologist 3, 187. Wainwright, M. (1994). Strange bumps in the data- mycological implications of the paradoxical concentration effect. Mycologist 8,169-171. Wainwright,M. (1994). Microbiology’s mysterious rays. Society for General Microbiology Quarterly 21, 3-5. Wainwright, M.(1994). Microbiology beyond belief Society for General Microbiology Quarterly 21, 95-99. Wainwright, M. (1995). The return of the cancer germ. Society for General Microbiology Quarterly, 22, 48-50. Wainwright, M.(1996). Microbiology of the future and the future of microbiology. Society for General Microbiology Quarterly, 22, 132-134. Wainwright,M. (1996). Psychoneuroimmunology- Microbiology meets psychology. Society for General Microbiology Quarterly, 23, 49-50. Wainwright,M. (1997). The neglected microbiology of silicon, Society for General Microbiology Quarterly, 24, 83-85. Wainwiright, M. (1998). The secret of success-the contribution of Arthur Nobile to research on steroids. Chemistry in Britain 34, 46-47. Wainwright,M.(1998). Who invented the Petri dish? Society for General Microbiology Quarterly 25,98-99. Wainwright,M.(1998). The relevance of the history of microbiology .Society fro General Microbiology Quarterly ,25,148. Wainwright, M. (1998). Living alternatives to antibiotics. Society for General Microbiology Quarterly, 25,128-129. Wainwright, M. (1998) The relevance of the history of microbiology ( Letter) Society for General Microbiology Quarterly, 25,150. Wainwright, M. (1989) A simple experimental demonstration of microbial growth and interaction. Journal of Biological Education. 22, 301-303. Wainwright, M., Ralley, L. and Adam Ali, T. (1992). The scientific basis of mould therapy. Mycologist 6, 108-110. Barakah, F.N. and Wainwright, M. (1999). Oligotrophic growth of soil fungi. In: Proc. 3 Intern. Conf. on Desertification and Environ Studies King Saud University pp.303-313. WAINWRIGHT, M. 2010a. Musings on the Origin of Life and Panspermia. Journal of Cosmology, 5, 1091-1100. WAINWRIGHT, M. 2010b. The origin of species without Darwin and Wallace. Saudi journal of biological sciences, 17, 187-204. WAINWRIGHT, M. 2010c. The overlooked link between non-virus microbes and cancer. Science progress, 93, 393-402. WAINWRIGHT, M. 2012. An introduction to environmental biotechnology, Springer Science and Business Media. WAINWRIGHT, M. 2013. Biotechnologie mit Pilzen: Eine Einführung, Springer-Verlag. WAINWRIGHT, M. 2014. Astrobiology: Prescient words on comets and life. Nature, 516, 329-329. WAINWRIGHT, M., AHARBI, S. and ALABRI, K. 2011. Panspermia-Nature’s Exercise in Microbial Cultivation on a Vast Scale. Journal of Cosmology, 16, 6711-6717. WAINWRIGHT, M. and ALHARBI, S. A. 2011. The story of a largely unknown evolution–Germ theory hoax. Saudi journal of biological sciences, 18, 311-316. WAINWRIGHT, M. and ALSHAMMARI, F. 2010. The Forgotten History of Panspermia and Theories of Life From Space. Journal of Cosmology, 7, 1771-1776. WAINWRIGHT, M., FAWAZ ALSHAMMARI, F. and ALABRI, K. 2010. Are microbes currently arriving to Earth from space. Journal of Cosmology, 7, 1692-1702. WAINWRIGHT, M., ROSE, C., BAKER, A., WICKRAMASINGHE, N. and OMAIRI, T. 2015a. Biological Entities Isolated from Two Stratosphere Launches-Continued Evidence for a Space Origin. Astrobiol Outreach, 3, 2332-2519.1000. WAINWRIGHT, M., ROSE, C., OMAIRI, T., BAKER, A., WICKRAMASINGHE, C. and ALSHAMMARI, F. 2014a. A Presumptive Fossilized Bacterial Biofilm Occurring in a Commercially Sourced Mars Meteorite. Astrobiol Outreach, 2, 2332-2519.1000. WAINWRIGHT, M., ROSE, C. E., BAKER, A. J., BRISTON, J. and WICKRAMASINGHE, C. 2013a. Allen Hills and Schopf-like putative fossilized bacteria seen in a new type of carbonaceous meteorite. Journal of Cosmology, 22, 10198-10205. WAINWRIGHT, M., ROSE, C. E., BAKER, A. J., BRISTON, J. and WICKRAMASINGHE, N. C. 2013b. Typical Meteoritic Worm-Like Forms Seen in the Polonnaruwa Meteorite. Journal of Cosmology, 22, 10152-10157.